What an honor I have been given today!!!! Back in August, I was asked if I would consider reading and reviewing a book, The Lies We Told, by this very author and it was phenomenal. A 5/5 in my opinion. So when Tricia, from Meryl L. Moss Media, contacted me again, not only to read and review Ms. Chamberlain’s newest novel, but also introduce her to all of you, I was thrilled. So please meet and welcome, here today, Ms. Diane Chamberlain!!! Diane is the award-winning author of 20 novels published in more than 11 languages. She writes complex stories about love, compassion and forgiveness. Her books, which are often set in her home state of North Carolina, feature a combination of family drama, intrigue and suspense. Diane was born and raised in Plainfield, New Jersey. She also lived for many years in both San Diego and northern Virginia before making North Carolina her home. Diane received her master’s degree in clinical social work from San Diego State University. Prior to her writing career, she was a hospital social worker in both San Diego and Washington, D.C. She also was a psychotherapist in private practice in Alexandria, Virginia, working primarily with adolescents. Several years ago Diane was diagnosed with rheumatoid arthritis, which has changed the way she works—she sometimes types using voice recognition software. She feels fortunate that her arthritis is not more severe and that she is able to enjoy everyday activities as well as keep up with a busy travel schedule. Diane lives with her partner, photographer John Pagliuca, and her shelties, Keeper and Jet. Bestselling author of The Secret Life of CeeCee Wilkes and The Lies We Told, Diane Chamberlain returns with her twentieth and most gripping novel to date, THE MIDWIFE’S CONFESSION (Mira Books; May 2011, $15.95), about two women who embark on a investigation of their best friend’s untimely death, ultimately revealing a powerful secret that threatens to destroy everything they thought they knew about her. When Noelle Downie is found dead of an apparent overdose, her best friends Tara and Emerson are left blindsided by her death and struggling with burning questions. Everything they knew about their longtime friend—her natural calling as a midwife, her passion for causes, her love for her friends and family—portrayed a woman who completely embraced life, not someone suicidal. Clearing out Noelle’s small home, Tara and Emerson encounter old photos, handwritten birth records, and sincere thank you notes from Noelle’s former patients—no hint that Noelle had been unstable during the years leading to her suicide. But among Noelle’s belongings, an unfinished letter is discovered—a clue to a disturbing past and an unbearable secret. With just one piece to the puzzle, Tara and Emerson commit to digging deeper for clues, slowly peeling back years of hidden deception that had been silently tearing apart their best friend. 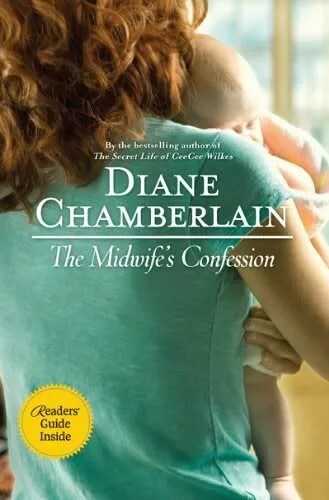 Read my review of this novel, The Midwife’s Confession, below. I HAVE ONE (1) BOOK TO GIVE AWAY.